The Union health and family welfare ministry's AYUSH department, whose job is to promote alternative medicines (Ayurveda, Yoga and Naturopathy, Unani, Siddha and Homoeopathy), appears to believe that as a matter of “policy” it should not recruit Muslims as Yoga teachers or trainers. In reply to a right to information (RTI) plea by an “investigative” journalist Pushp Sharma, the AYUSH department has said, "As per government policy, no Muslim candidate was invited, selected or sent abroad" in the year 2015 for the World Yoga Day, celebrated annually on June 21 and declared as “internationally recognized” by the United Nations General Assembly on December 11, 2014. The All-India Muslims Personal Law Board (AMIPLB) in a controversial statement had said last year that there was a “contradiction” between Islam and Yoga. It is not known if the RTI reply was given, taking advantage of the AIMPLB's stance. Which came under heavy criticism, among others, several Muslim experts, who happen to be Yoga practitioners. 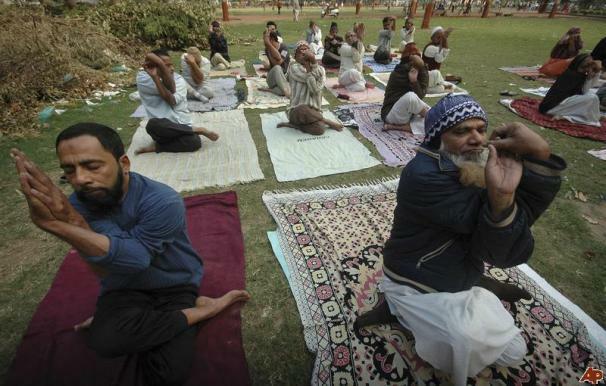 In reply to a right to information (RTI) plea to Pushp Sharma, the Government of India department said that a total of 711 Muslim candidates applied for short-term assignment (trainer/teacher) during the World Yoga Day, 2015, and but none was selected per a "government policy." It further said that in all 3,841 Muslim candidates have applied as trainers/teachers, but not one among them was a Muslim. Sharma, who claims to be an investigative journalist,had sought details of the total number Muslim candidates who had applied for short-term abroad assignment (trainers/teachers) during much-publicized World Yoga Day last year as also the total number of Muslims who had applied for it so far. The journal further says, “Here we have, for the first time in the life of this government, a written, blunt RTI reply in our hands which unashamedly says that it’s Modi government policy not to recruit Muslims in government jobs. This reply obviously concerns a certain scheme in a small ministry. You can only think of the wider implications of this policy across the government." Significantly, the AIMPLB, at its Jaipur meet just four days ahead of the World Yoga Day, which was widely propagated by by the Modi government, sharply criticized the move to “impose” Yoga, Surya Namaska and recitation of Bhagvat Geeta. A senior expert, Dr Badrul Islam, who has been practicing Yoga for the last 35 years in Jamia Nagar, a minority-dominated area in Delhi, for the last 35 years, contested the AIMPLB's view saying, "The objections are based on a misunderstanding of what Yoga is. Islam has also written a handbook in Urdu on the subject and is a Yoga instructor with the Kendriya Vidyalaya Sangathan. "Yoga is a clean thing, it helps you to connect with yourself, keeps you alert, smart and fit. As for surya namaskar, Islam enjoins you not to bow in front of anyone but Allah, so don't turn to the sun when doing it. Think of it as a form of exercise," said Islam, who is also a member of the NCERT editorial board that developed a curriculum for yoga in schools. 10:42 AM - 12 Mar 2016"